Kurt was born and raised in the San Francisco Bay Area. He attributes his artistic talent to his father and his grandfather who were both design engineers. Kurt was always interested in all forms of art, and would express himself at an early age. His high school ceramic class is where he first began experimenting with clay. After graduating from high school, he worked the waters of the Chesapeake Bay as a crab and oysterman. In the mid-80's, Kurt returned to his love of clay and established himself as a self-taught, award winning artist. McCracken has developed a fresh new approach to the ancient Asian art of raku, which dates back to the 16th century. 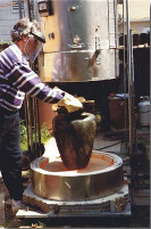 Because of the large scale of his creations, Kurt custom designed and built his own raku kilns. He selects special clays for each of his hand glazed pieces, which are individually fired at over 1800 degrees Fahrenheit. These red hot pieces are then transferred from the kiln to the reduction barrel. The glazes are oxidized with natural materials, such as pine needles, leaves and straw. This abrupt oxidation process is what produces the color, crackle and intensity that Kurt seeks in his pieces. McCracken's eye for traditional forms has ability to wheel-throw one piece of clay into extraordinarily large size forms. Often his vessels will exceed three feet in height. He loves to vary his art forms, creating large wall hangings, sculptures with glass and decorative plates. Some of his more contemporary works are ceramic towers (up to 8 feet tall) and abstract music designs. Kurt is also using his design talents to create large scale paintings on wood and canvas. Kurt's work is shown at fine art shows, galleries and collected by private and corporate clients internationally. He gladly accepts commissioned custom orders for his unique, one-of-a-kind creations.